390 SSBThis award-winning performer is often referred to as "the standard of the industry" by virtue of its capabilities and popularity. Reinforced insulating qualities allow input power up to 1 kw. Conductors are permanently sealed in Shakespeare white fiberglass. Chrome-plated brass ferrules, bottom ferrule has 1"-14 thread. Side feed termination band. Two sections: Base 162"; Tip 112". 393 SSBThe Style 393 antenna is electrically the same as the industry standard Style 390, but it's designed in three sections, so it can be shipped conveniently by UPS. For use only in moderate seas. Chrome-plated brass ferrules, bottom ferrule has 1"-14 thread. Side feed termination band. 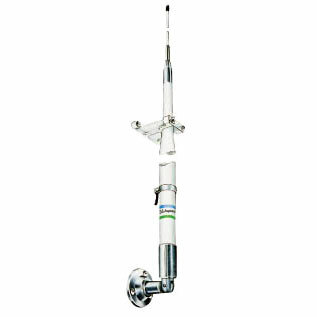 5390 17'6" VHF/SSB WhipHand crafted Galaxy® antenna with reinforced insulating qualities to allow input power up to 1 kw. Full-length conductors, no loading coil, permanently sealed in white fiberglass. Stainless steel ferrule with standard 1"-14 thread. Side-feed termination band. Two sections: Base 105", Tip 105" - UPS shippable. 5310-R 23' VHF/SSB WhipFull-length conductors, no loading coil. This hand-crafted antenna is a top performer for commercial vessels, yachts and larger sport fishing boats. Easily handles up to 1 KW input power. Brass and copper elements for maximum range and efficiency. Stainless steel ferrule with standard 1"-14 thread. Side feed termination band. Two sections: Base 172"; Tip 105". Twin to: Galaxy® Style 5309-R VHF.